In 2012, Pepsi and Coca-Cola’s aggregate share shrank by 7 percentage points to 64 percent, all the way down from an impressive 82 percent in 2010. While producers chalk the decline up to business optimization, experts link it with the trend of retail chains developing their own labels. As the indisputable leaders of the Russian juice market, PepsiCo Inc. and Coca-Cola Co., had, at one time, acquired Russia’s biggest local producers — Wimm-Bill-Dann and Lebedyansky, and Nidan and Multon, respectively. Now, however, both Pepsi and Coca-Cola are starting to lose their lead in the market. Taken individually, Pepsi's market share dropped from 45.4 percent to 40.3 percent in 2012, and Coca-Cola's share of the juice market went down from 26.7 percent to 24 percent. The Russian brand Sady Pridonia took the best advantage of its competitors decline, expanding its own share of the market from 6.7 percent to 9 percent. The Russian Union of Juice Producers estimated that the 2012 juice market reached 3 billion liters (101.4 billion ounces) or 155.6 billion rubles ($5.1 billion). Marketing director for PepsiCo's juice division, Natalia Vasina, attributes the fall in the company's total market share in 2012 to the fact that the company dropped some small local brands from its portfolio. Meanwhile, head of the agricultural sector at NEO Center Consulting Group, Anastasia Zalutskaya, sees the proactive development of retailers' labels as the main reason for the shrinking shares of Pepsi and Coca-Cola. “They offer more attractive prices than big market players,” says Zalutskaya. In her estimation, retail-label goods tend to be 10–15 percent cheaper than their direct competitors. This trend holds true for other agricultural market segments as well, not just the juice market, the NEO Center indicated. 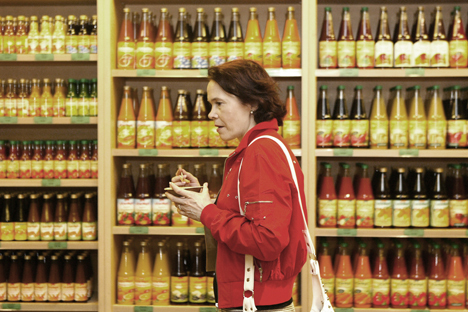 According to the Russian Union of Juice Producers, the share of retailers’ labels on the Russian juice market climbed 2–3 percentage points to 7 percent in 2012.